You can see a vivid yellow signboard on Yonegahama Street. That’s YOIZANMAI, a lively and happy izakaya. 2 minutes from Yokosuka Chuo Station. 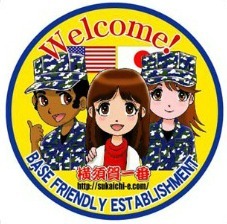 We specialize in original fresh local Yokosuka and Miura area foods and sizzling grilled dishes. Come on in for drinks and great food, with decor from Japan's 1800s! Closed: Sundays & *national holidays *For consecutive national holidays, please ask us beforehand if we are open on some of the days. We offer Edo-style fresh seafood caught in this morning. GOOD JOKES and GOOD DRINKS! Come to join Betty for both American and Japanese food at reasonable price! Closed: We don't have a fixed closing day. Please call to inquire if we are open.